Living an active and busy life shouldn’t interfere with your qualities as a pet owner. Unfortunately, since you can’t always look after your dog the way you want to, you will need to rely on the help of some gadgets, including the best automatic dog feeder for large dogs. And if you can’t find the time to search for such an item yourself, we got you covered. After conducting a thorough market research, Dr. Fox concluded that a reliable item for you would be the AmazonBasics Self-Dispensing Gravity. It is available in two sizes and also comes with a bowl for water with a capacity of 2.5 gallons. It relies on gravity to provide a consistent supply of fresh water and food every time and features extra-wide mouths for easy cleaning and filling. If this product is not available for sale right away, perhaps a good alternative would be the WOpet 7L Automatic. This 2-in-1 machine is equipped with a feeder and a waterer, both large enough to provide enough quantities of fresh water and food for a few days. The product is great when you live a busy life and don’t have time to feed your pets at regular hours. 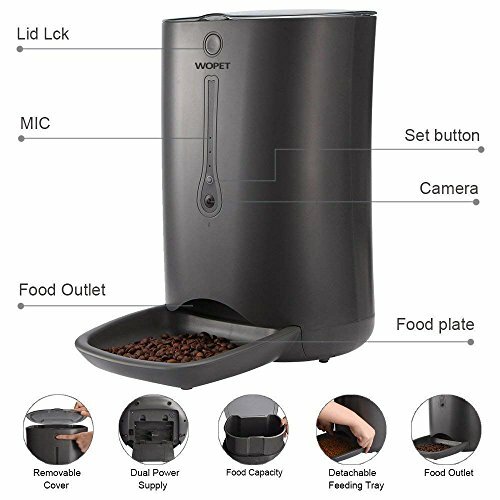 It comes with two cut-out handles for easy lifting, while the non-skid rubber feet allow you to place this food dispenser on any type of surface you want. It doesn’t allow you to preset the amount of food you should be feeding your pet each meal, which could lead to overweight and obesity problems in the future. 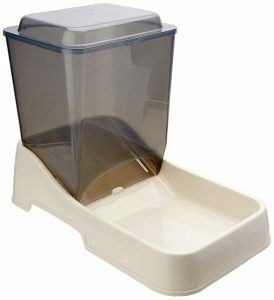 Convenient and easy to use, this 2-in-1 waterer and feeder ensures your pet is well-fed even when you’re not around. It comes with a large container for food that can store up to 236 fl.oz. of your pet’s favorite kibbles. Thanks to the built-in programmable timer, you can pre-schedule up to four meals a day, depending on your pet’s diet requirements. The machine features a large LCD screen and control buttons that are easy to operate. You also have the opportunity to record a small voice message for your dog or cat. Some customers complained about the poor quality of the recorded voice message, saying it is hard to distinguish from background noises. The item is great if you’re carefully looking after your pet’s diet in order to avoid overfeeding and weight gain. The product has a total food capacity of 10 pounds, perfect for keeping your pet full for a couple of days. It is convenient and easy to use as it doesn’t come with sophisticated functions. The dispenser is specifically designed for the needs of large dog breeds that consume more food. The removable lid is dishwasher safe and, therefore, easy to clean in just a few minutes. Since there is no food-locking mechanism present, your dog might put its head around and eat the entire container of food at once, making it sick, so be careful. Convenient and affordable, this product could make an interesting choice only if you closely watch your pet to avoid overeating. We know you look after your pet, but we also know that being around it 24/7 is nearly impossible. This is why we think considering an automatic feeder could prove a smart move, especially if you plan a weekend getaway with your loved one and none of your friends is willing to babysit your pet. To make your decision easier, we have gathered five of the most sought-after items on the market. Showcased below you’ll find everything you need to know about them. This 2-in-1 waterer and feeder is the perfect solution for busy people. The large pet waterer has a total capacity of 2.5 gallons, while the pet feeder capacity is about 12 pounds. When full, the product can provide enough fresh water and food for your dog for a couple of days, depending on its size, weight, and age. The item relies on the simple principle of gravity to dispense a consistent supply of fresh water and food. It is made of sturdy and BPA-free materials so it won’t affect your pet’s health in the long term. The item could be quite heavy but, thanks to the side cut-out handles, you’ll easily lift it and carry it everywhere you want. Moreover, the non-skid rubber feet ensure a secure placement on any type of floor, including tiles or hardwood floors. Since the capacity of this food dispenser is big, it makes the perfect item for a house full of pets or for those who own a large breed dog. Also, the machine features an extra wide mouth hopper and water bottle to fill them and clean them easily. The item is suitable for those who have more than one pet since it dispenses a large amount of food. Despite its bulky design, it is easy to handle and transport thanks to the side cut-out handles. Also, the rubber feet prevent slipping and ensure a secure placement on any type of floor inside or outside the house. The dispenser is made of high-quality and non-toxic materials that don’t pose any threat to your pet even if he or she decides to start chewing on the machine. The wide mouth containers for food and water ensure easy filling and cleaning whenever you need. For those who don’t have too much spare time to clean after their pets, this item could be a bit inconvenient since it must be washed manually. It contains sensitive parts that don’t allow it to be placed in the dishwasher with the rest of the dirty dishes and cutlery. This item is the right choice if you want to dispense the perfect amount of senior dog food and look after your pet’s diet. It allows you to pre-schedule up to four feeding per day thanks to the built-in programmable timer. 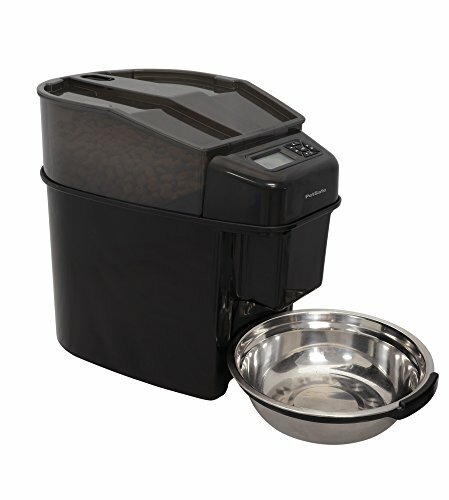 The food dispenser features a large LCD screen and buttons that are easy to operate even by those who are new in the world of automatic dog food containers. You can either connect the device to a regular power outlet or use batteries to operate the dispenser. Thus, you won’t have to worry about the product running out of batteries or the sudden interruption of electricity due to malfunctions or harsh weather conditions. Depending on your dog’s size and breed you can opt for food portions ranging from 2 teaspoons to 4.5 cups of food so you can provide a balanced and nutritious diet without overfeeding your pet. Another great feature that will undoubtedly attract more customers is the fact that you get to record a small audio message for your dog and display it whenever it’s high time for lunch or dinner. This will make your absence more bearable for your pet. You get to choose from various functions so you fully customize the feeding preferences, according to your pet’s needs. Therefore, there won’t be any mistakes, and your pet will rely on a strict and balanced diet, without risking to gain weight. The product allows you to measure and control each portion of food, which makes it an excellent tool for those who want to determine their pets to lose a few pounds and become more active. You can either plug it in an outlet or use batteries to operate it and make sure it will dispense food everytime you need it to. Another great feature is that you can record your personal message to play each time your pet needs to eat. 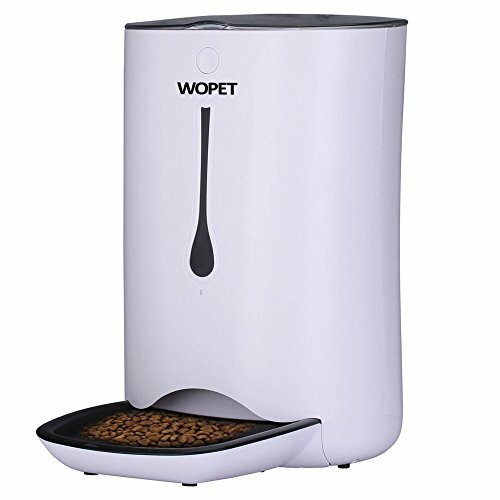 Unfortunately, the product will only dispense dry food so don’t try filling it with semi-wet or wet food as you’ll end up clogging it. Keep in mind that your pet requires a balanced nutrition, based on both dry and moist foods. An organic salmon dog food is rich in fish oils and will promote healthy bones and a luscious coat, so make sure to integrate it on a regular basis in your dog’s dietary habits. If you’re looking for an affordable product that is not too complicated to use and doesn’t require electricity or batteries, this item should be on your shopping list. The auto feeder comes with a large 10-pound bowl, suitable for large breed dogs and multiple pets living in the same house. The machine releases food as the bowl gets empty, meaning you don’t have to struggle with complicated functions, LCD screens, and buttons. It is excellent for those who spend most of their time at home with their pets but don’t want to keep an eye on their eating habits constantly. It is made of plastic and comes with a transparent food recipient that allows you to see when you have to refill it. The removable lid ensures easy cleaning. You can choose to clean the tray both manually or in the dishwasher, meaning it won’t take you more than a few minutes to sanitize the item. This is a great item for beginners who don’t know precisely how more complicated machines work. However, some of the customers were not entirely pleased with their acquisition. It is easy to use and doesn’t require any professional set up or complicated user manual. The large 10-pound container is suitable for families with multiple pets or for those who own large breed dogs that require a specific diet. The item comes with a removable lid that allows you to clean it in the dishwasher or manually. The open top option is not something you usually encounter in products within this price range, but it is advantageous as it reduces spilling and food waste. Since there is no actual control of the amount of food the dispenser releases, there is always the risk for your dog to eat the entire amount of food at once, leading to health problems and overweight. The large container of this dispenser holds up to 24 cups of dry food for dogs or cats, making it reliable whenever you plan a weekend getaway with your loved ones. It comes with a bowl that holds up to 5 cups of food, suitable for most dog and cat breeds. It lets you program up to 12 meals to feed according to your pet’s schedule and, thus, contribute to a healthier and more balanced diet. The Immediate Feed Mode option is perfect when you want to offer your pet a snack, including some healthy and delicious dental sticks for dogs, outside the regular feeding times. The Pause Feed mode allows you to temporarily interrupt the feeding without losing any of the pre-programmed meals. 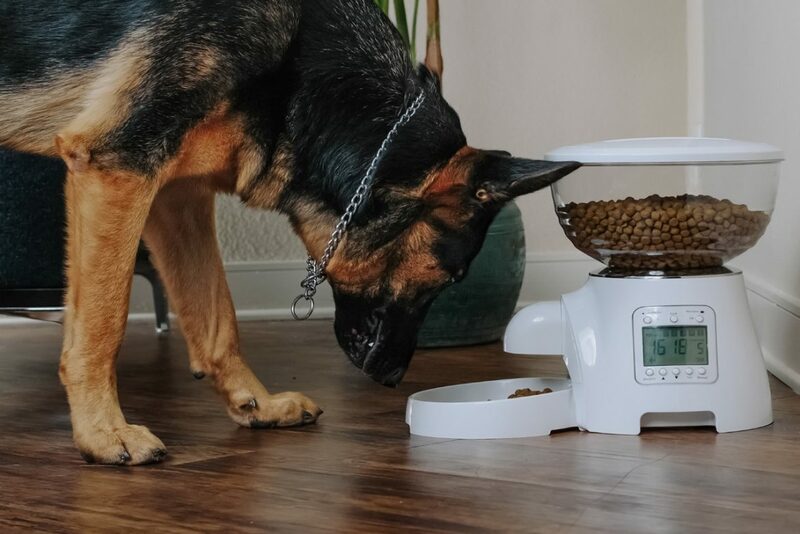 The product also features a Slow Feed mode that can dispense the food for a 15 minute period of time to prevent overeating, vomiting or bloating for pets that have a big appetite. Another great thing about the feeder is the flexibility of the portions. Depending on your pet’s dietary habits and vet recommendations, you can provide from ⅛ cups to 4 full cups of kibbles per each meal. Also, the bowl is made of stainless steel which means your pet won’t be able to chew it. It comes with many functions that provide a fully customizable feeding experience, suitable for dogs of all ages and breeds. According to your pet’s age and recommendations, you can provide anywhere between ⅛ cups and 4 cups of food for each meal, ensuring a complete and balanced diet. The product is easy to clean as the hopper, the bowl, the bowl holder, and the lid are dishwasher safe. All parts are made of high-quality materials such as BPA-free plastic and stainless steel to prevent your pet from chewing. Some customers said the item is quite tricky to program and you’re going to spend some time until you adjust to it. It’s best to read the instructions carefully and run a few tests to make sure the amount of food dispensed is the right one for your pet. Also, inform yourself about the easiest way to return this feeder if you don’t like it or it’s not suitable for your home. Some of the owners claimed it’s hard to return if you buy it from a third party. 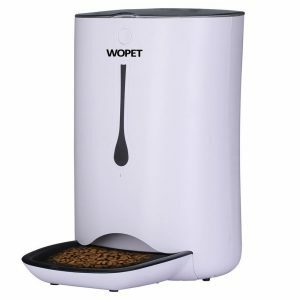 If you’re looking to invest in a futuristic, high-tech feeder for your pets, you might want to take a look at this WOpet item. It’s suitable if you have a busy schedule and can’t always be around when it’s lunch time for your dogs or cats. 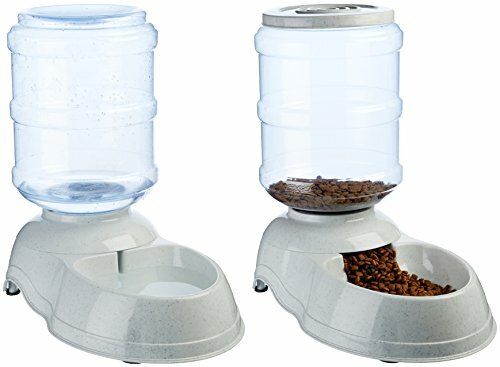 It comes with two food dispense trays, so you can pick the right size according to your pet’s needs. You can program it to dispense anywhere from 1 to 39 portions, each portion weighing 10-12 grams. This way you will help control the body weight of your dog and make sure it doesn’t gain the extra pounds if he or she doesn’t need them. The product allows you to provide up to six meals a day, so you can easily plan a short trip or a weekend getaway without asking your friends to babysit your pet while you’re gone. There are plenty of features you can adjust directly from the Pet-U application. It is compatible with both iOS and Android operating systems and can be downloaded for free. The feeder supports a 32GB micro SD card and is even equipped with a camera so you can see what your pet is up to from every corner of the world. The free app for your phone or tablet is really useful if you have a hectic schedule but still want to make sure your pet receives all the care and attention it needs. Through this app, you can adjust and control the dog’s meals and make sure it follows a strict diet. The product can dispense up to six meals a day, each meal ranging from 1-39 portions, according to your dog’s needs. It comes with an HD camera for video and voice recording and works with the Pet-U app that allows you to play, talk, and see your pet. It also allows you to record a voice message for your pet that will be played when it’s time to eat. The item only works with dry food and rather small kibbles so make sure you purchase the right type of food if you don’t want it to be stuck in the tube. For a balanced and complete nutrition, we strongly advise you to consider adding home cooked foods and organic recipes in your pet’s diet, including some delicious and low-calorie puppy training treats. Finding a good automatic dog feeder for large dogs could take a lot of your precious time, especially if you’re looking for a product with multiple features. To make your life easier, here are some of the most important characteristics your pet feeder should have. A sturdy and reliable design is the number one rule if you want to make sure your machine lasts more than a couple of months. Keep in mind that large dogs have plenty of power in their bodies and also come with strong teeth, so you want your product to stay in place and remain unchewed. Avoid flimsy and low-quality plastic that you usually get in cheap automatic dog feeders for large dogs as it won’t last in a house full of pets. If you are not willing to spend more than 70-80 dollars on a dog feeder, at least opt for products that are made of BPA-free plastic, stainless steel, and other antibacterial materials to ensure a good oral hygiene and keep your pet away from bacteria. Consider some rubber feet as well that won’t slip when placing your feeder directly on the floor, be it tile or hardwood. Depending on the type of product you opt for, you can dispense dry or semi-moist food. As we previously mentioned, it is crucial to offer a diversified diet for your pet and not only stick to dry kibbles. 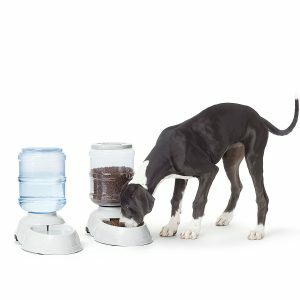 We encourage you to find a food dispenser that also allows you to add dog food cans or home cooked meals for extra taste and a boost of vitamins, minerals, and antioxidants. We also strongly advise you to combine your pet’s dry diet with wet and home cooked meals, including some organic dog treats for teeth or delicious low-calorie dog food for weight loss. The size of the kibbles is essential if you don’t want your food stuck in the machine. Keep in mind that some products come with narrow tubes that won’t allow you to put all types of kibbles available on the market, especially the ones made for large dog breeds. If you want to make sure you purchased the right machine, try going for some online reviews of automatic dog feeders for large dogs, and read what other customers have to say. Some products come with complicated functions that make you and your pet’s life easier. You can customize the amount of food your pet receives for each meal and make sure it doesn’t get overweight or obese. Most machines allow you to feed your pet up to six times a day, but for a proper diet, we suggest three main meals and 1-2 healthy snacks in between. If you really want to go the extra mile and invest in a high-tech feeder, you can also benefit from a camera or a voice recorder mechanism that allows you to communicate with your pet no matter where you are. 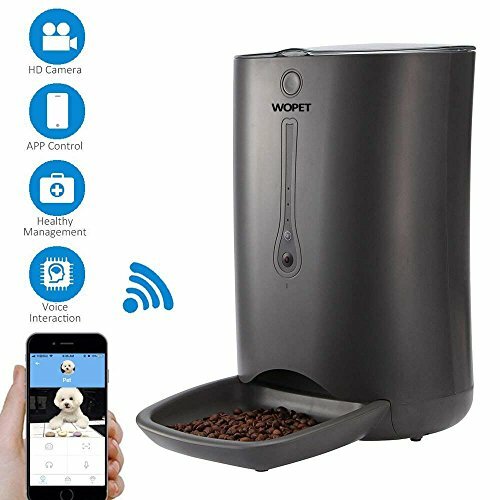 The smart machine can be connected to your wireless router and, with the help of an app you download to your phone or tablet, you’ll be able to see what your pet is doing any moment of the day.